The Details: Ayashi no Ceres seemed to gain immediate popularity through virtue of being written by the same author as the well-loved Fushigi Yuugi. There are a lot of similarities between the stories, but also a lot of differences. 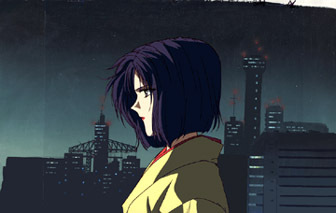 Whereas Fushigi Yuugi is longer-running, and had the time to be funny and corny before the darkness began settling in, Ayashi no Ceres' darkness kicks in right before the end of the first episode and continues to grow. There are hokey moments (or at least one Touya issue struck me that way), but there is a lot of interesting tension and morbidity to go with it. Combining the Tennyo legend with the C Genome project also provides a mixture of science fiction and fantasy in a contemporary setting. In a story like this it's almost inevitable to try to select favourite couples. I (very decisively, unlike with the other series) thought Ceres and Yuuhi were the most lovable couple. Seeing more of them would have been wonderful. There could have easily been two ongoing romances since Aya (unlike a certain lead heroine in another story who has trouble making up her mind) is two different people and therefore has a reasonable excuse. As Aya she could've gone for Touya. As Ceres, she could've gone for Yuuhi. It was worth hoping for, anyway. ;) Or it was worth hoping for that Ceres would take over Aya's body, dispose of Touya, and run off with Yuuhi! Ah, kind of joking. I admit to having been highly amused by the end verdict, but I won't get into that. There are many other interesting characters. I adore Yuuhi's sister (in-law) Suzumi. Kagami's a good character overall, but he gets a bit too disgusting for me at least once. I have trouble with Touya because his personality is pretty flat as a storyline necessity, but at least his background is good story material. Chidori is highly sympathetic. Alec is a cutie, but maybe a little too nice for me... which doesn't make sense when I like Yuuhi, heh. I think the difference is that Yuuhi is Yuuhi, instead of someone who willingly got involved with experiments that he was too nice to live up to well. Wei is a cutie too (more than that, I think he's the best-looking guy in the series), but is barely around. Aki is... I wouldn't know how to sum him up beyond "Where's my woman?!" (or "Boku no onna, doko da?!"). He's fun, as long as there are a few dimensions of reality separating us.